Where does your chocolate come from? Does it matter if your coffee is fair trade or not? It matters–more than you might think. 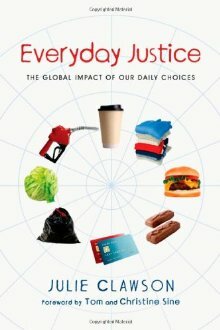 Julie Clawson takes us on a tour of everyday life and shows how our ordinary lifestyle choices have big implications for justice around the world. She unpacks how we get our food and clothing and shows us the surprising costs of consumer waste. How we live can make a difference not only for our own health but also for the well-being of people across the globe. The more sustainable our lifestyle, the more just our world will be. Everyday justice is one way of loving God and our neighbors. We can live more ethically, through the little and big decisions we make every day. Here’s how.